Project Run and Play: It's TIme to Vote---Here are the Designs for Sewing Through the Decades! It's TIme to Vote---Here are the Designs for Sewing Through the Decades! This week I chose the era of the 1910's because I absolutely love the Edwardian Era's fashion. And, lucky for me, I've been totally inspired by BBC's Downton Abbey. Fashion changed a lot during WWI so this is really the last era of dresses women needed help getting into and out of without a lady's maid! I was inspired by the straight skirts, shorter over skirts, chiffon sleeves and delicate details. You can read more about my inspiration at The Train To Crazy. I made two dresses because I can hardly make one for one girl and not the other. And, of course, their little sister is wondering why she didn't get a fancy dress. This pink fabric is a taffeta. I don't usually think "beautiful" when I think of taffeta I think "80's prom dress" but this fabric is gorgeious. I love the gathers. She picked it out so it probably isn't a traditional Edwardian Era color but who can deny this girl her pink dress? The floor length skirt is layered with a knee length bubble overskirt of the same fabric, as was traditional at that time. The waistband is black satin and the shoulder straps are a gray shantung silk. The top is fully lined, of course. The back is closed with an invisible zipper. The second dress is made from a gorgeous satin. The satin looks like it has a lace overlay and is very feminine without being too girly. The bodice is fully lined and the skirt is floor length. The top is overlayed with a black chiffon. If you have ever worked with chiffon you know its difficulties but I knew it would be perfect for this dress. I hemmed the neckline and the sleeves with a gorgeious trim that I think adds the perfect touch to the top. The dress is finished with a velvet wasitband. The back is closed with a zipper again. Please go over to my blog for more details about Downton Abbey, my inspiration and my dresses! I have been stopped in the store on more than one occasion and told that my daughter looks like an old fashioned doll. If I might be permitted to revel in her a bit... that creamy soft skin, wide blue eyes, and golden curls make her look like she just stepped of the pages of a vintage golden book. So I really wanted to just go with that notion and make her something sweet and innocent looking. This look is inspired by the late 1940's, a time when fashion was characterized by soft feminine shapes, and an emphasis on shoulders and waists. The color palate was sort of inspired by one of our favorite little golden books, "A Day at the Seashore." This soft cotton lawn floral sun-suit is based on a pattern I created last spring, and added a removable collar (when that sort of thing might get in the way of digging in the sand), and hidden snaps at the crotch to more easily get in and out. I paired it with a vintage scarf, bow, and our favorite salt water sandals for a simple sweet look. Perfect for a day at the seashore. I'm so enthralled with sixies fashion and Twiggy is one of my favorite fashion icons! So for this theme, I took merged two 60s trends: flower power and space age mod into a 3-part outfit that Twiggy might have worn! I picked up one of my old sheets I've been stashing with a totally sixies brown floral print, some vintage buttons and a little muslin. I created a tent shaped oversized peter pan collar sixies mini dress. There's an invisible zipper in the back, a cream colored peter pan collar and little bow in front. It has short sleeves and looks so 'groovy' with knee-highs. 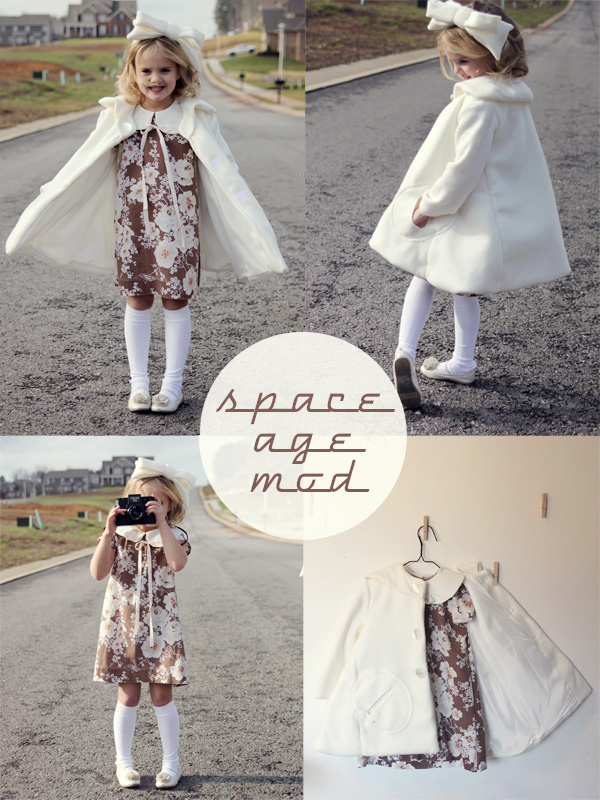 60s space age mod was my inspiration for this cream overcoat. I used cream fleece to mimic the wool coats that were so popular in the 60s. I made it just the same length as the dress so the brown floral would poke through a little with movement. The sides flair out like a spaceship! The coat is fully interfaced with fleece interfacing, center fronts are faced and it is fully lined with cream rayon and a touch of the brown floral. The inside is so nice and smooth. Since the front of the coat is thick I opted to sew on vintage buttons for the mod look and hide velcro underneath. My favorite parts are the big geometric oval slit pockets on the front and the super cozy collar. I used leftover fleece to make a big bow headband. Check out my blog see kate sew today for more space age fun! I was really excited about this challenge and had a hard time picking which decade I'd like to sew from. I decided to try to go beyond my comfort zone and try more of a frilly, girly look this week. That's when I thought of Grace Kelly. Not only beautiful, she was a movie star, an actual princess, and style icon. This dress was inspired by a red lace gown she wore in Alfred Hitchcock's 1954 film, Dial M for Murder. 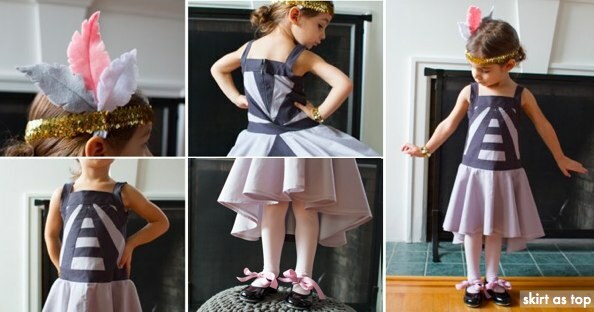 So of course a little princess would need not only the gown, but a dress coat and coordinating clutch. Initially I thought lace would be too adult for a little girl, then I remembered I had this ivory polka-dot lace I'd been saving, and thought it would work great for a little tea length princess dress. Because the lace was ivory, I had to hand dye all my fabrics so they'd coordinate. It was kind of tricky because the lace was ivory, and the base, tulle, and organza skirt were all white. So I learned a lot about dying fabric and lucked out that they all ended up the same shade of seafoam green. I made the actual design of the dress to be quite simple, so it wouldn't compete with the large polka-dot lace. The bodice is a simple v-neckline with unlined lace sleeves. The full circle skirt has six layers to achieve the 50s fullness and didn't even need a pettiskirt underneath. 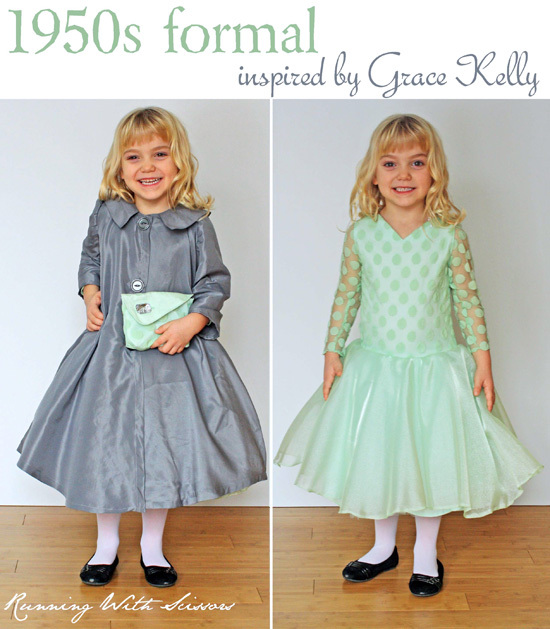 More info, photos, and original inspiration Grace Kelly gown on my blog! My very favorite decade is the 1920s. Really interesting and wonderful things were happening in the arts, music, film, architecture, and most of all, fashion. Women tossed their corsets in favor of looser-fitting, drop waist dresses, and as the decade progressed hemlines shortened to the knee, which allowed ladies to DANCE! My house was built in the '20s, my wedding ring is from the '20s, and that time in history just fascinates me. The decision of which decade to "sew through" for this week's challenge was an easy one for me! I was inspired by the beautiful geometric Art Deco architecture of the later 1920s as well as the dance-friendly fashion of the flapper girl, and merged the two in an Art Deco twirly dress for my dance-loving little gal. I constructed a fitted drop waist bodice out of geometrically pieced charcoal cotton and light gray voile. I then attached a circle skirt with a fishtail hemline, which is knee-length in the front and calf-length in the back. The back skirt has a triangle pieced into it in the charcoal cotton, which reflects the asymmetrical sunburst design of the back bodice. The shoulder straps are wide strips of the charcoal gray cut on the bias, which also bind the armholes. The dress is fully lined in gray batiste, and closes with an invisible zipper and a hook and eye. Geometric shapes and sunbursts were common themes in Art Deco design, so I pieced the front bodice of the dress with triangles and trapezoids radiating upward toward the yoke in alternating light and dark gray, with a pieced striped triangle in the center. I carefully constructed the front bodice to be perfectly symmetrical and fitted to my daughter while still allowing her to move and dance as a three-year-old should! To add whimsy and give a nod to the beautiful headpieces that the ladies of the '20s wore, I made a gold sequined headband and stitched on hand-cut light gray, pink, and white felt feathers. The pink feather was chosen by my daughter, who loves all things pink. I also made her a little gold sequined bracelet, and I laced her tap shoes with a lovely pink chevron ribbon. This dress was truly a labor of love for me, and one that I am so proud to have turn out just as I imagined it. 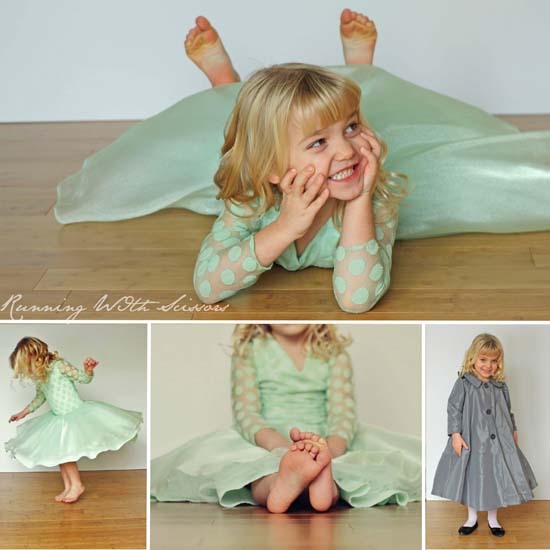 Come on over to see me at skirt as top today for more on my inspiration, my initial sketch, and more photos of my little flapper girl tapping away in her new twirly dress! I just couldn't NOT do an 80s inspired outfit this week. Fashion in the 80s was SO. MUCH. FUN. culture and memorable fashion trends of the 80s, but also something that could be worn today. I think the end result is TOTALLY cool! freely in her skirt without worrying about any undergarments showing. Perfect! denim rocker jacket. 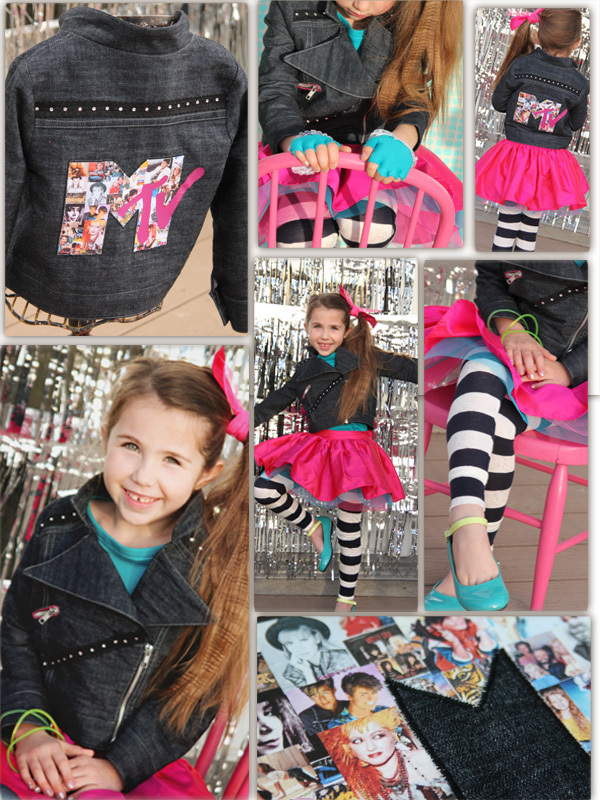 No 80s outfit would be complete without the tried and true jean jacket! around. Revisiting images from my childhood through this project was so much fun! teal flats, crimped hair, and a coordinating bow! Oh no! So torn about who to vote for, they are all amazing! Aimingfortheswanlike----the voting is now up! Oh man! I love them all!!! Seriously tough decision....gonna have to ponder a bit before voting! Great work ladies!!! The 80's outfit is my fav! Oh my gosh so so much fun! wow - so great, all of them!! How do we vote? I love all of them! I LOVE LOVE LOVE the Twiggy! How do i vote ??? LOVE the 80's!!! My favorite!! Way to go!! This is the first one I've been able to vote for, but I didn't realize it was going to be so hard! Seriously SO hard to decide! Great work ladies!!!! I loved the sunsuit instantly, but had to choose the Flapper Tapper - it's gorgeous, she is going to wear it every day, and that fitted bodice is really great craftsmanship! Wonderful job, Kristin! I found it so interesting that all 6 of the designers picked a different decade ~ such diversity this week !!! They are all so amazing but I would choose the 80's dress because it is the one I would most love to make for my daughter. Skirt as Top you're my hero forever after this effort! 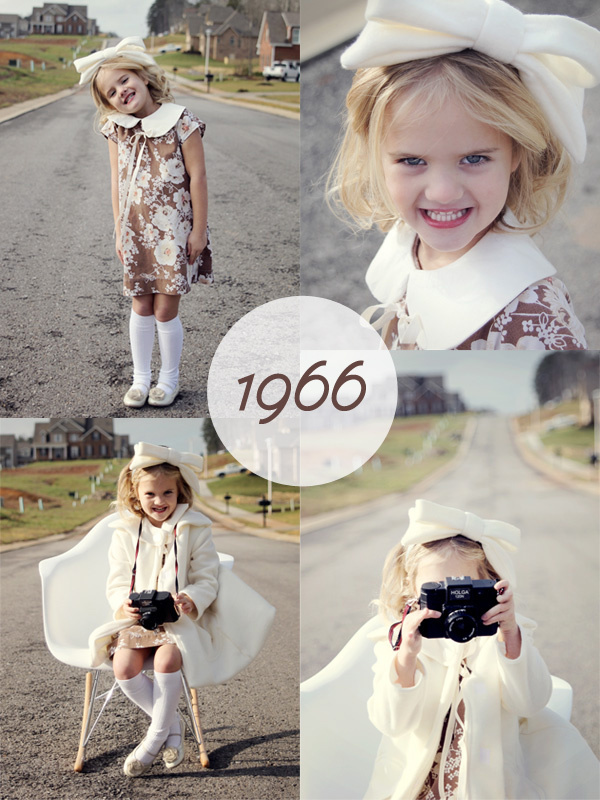 I'd definitely go for the little twiggy 60's outfit!! Definatley Twiggy! She is adorable!!! I love everything about that outfit! Wow! Such a tough call! I love Downton Abbey from the Train to Crazy, but the navy bodice doesn't look quite right. I would vote for Girl Inspired's 80s outfit!! That jacket took quite a lot of skill and the outfit IS super cute and probably... weirdly enough, the most actually wearable. Thanks for hosting this! I'm new and it looks SO cool! the voting poll isn't working for me! 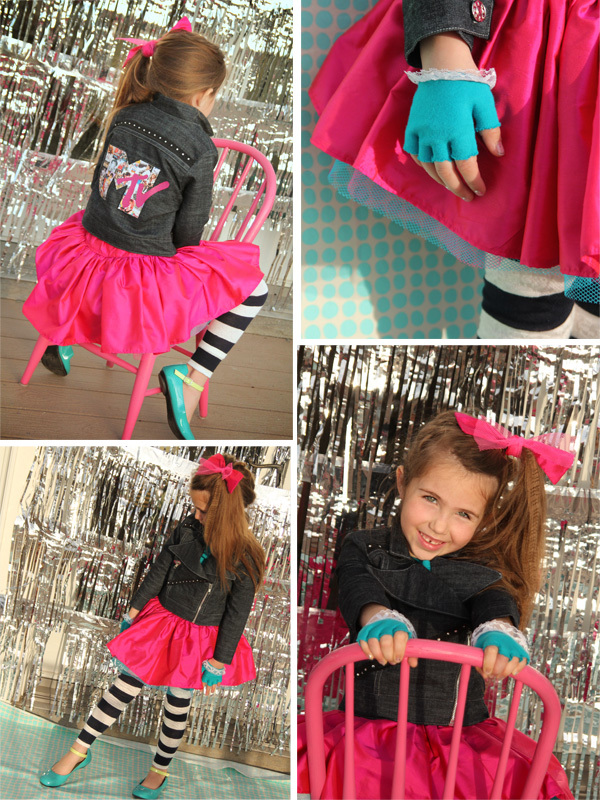 I'm totally digging Girl Inspired's 80's look! I want that whole outfit!! GO STEF! I vote for the Flapper Tapper costume by Kristin (skirtastop). LOVE it! These are all so amazing! It was hard to chose between my favorites, the 60's and the Flapper Tapper, but I think I'll go with the Flapper. The piecing in the bodice and back, and the skirt took quite a bit of sewing and design skill and is so amazing! 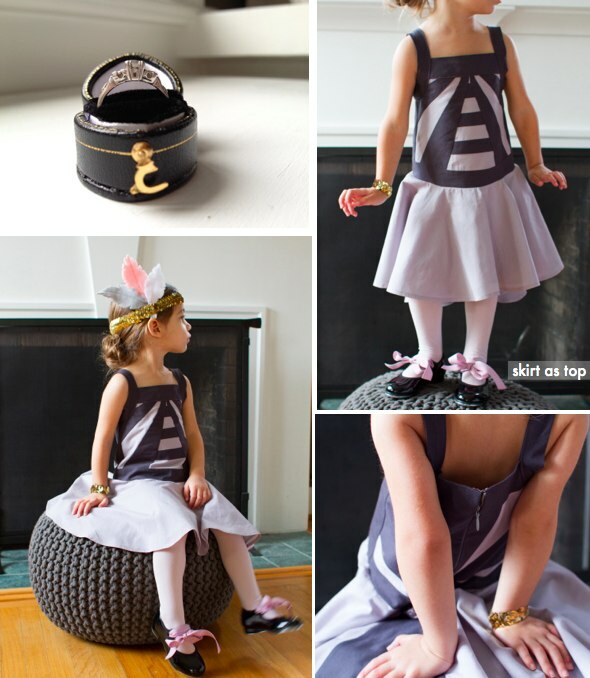 I'd love it in an adult size for a party dress for myself!! 80's all the way! I love Kristin's as my second choice though and really struggled not choosing that beachy outfit! Great job everyone! I vote Jessica! I love grace kelly style.